Compact because it has been designed for on-site use, the C.A 6470N is rugged and leakproof. To simplify connection, the 4 terminals for connecting the stakes are colour-coded to help identify them. The C.A 6470N includes a large backlit LCD screen and a battery which is rechargeable with an external charger connected to the mains or to a vehicle cigarette lighter. It is also equipped with a function for direct, ordered storage of the measurement results. A USB communication output can be used to export the data onto a PC in order to process them with the Ground Tester Transfer software. for soil resistivity measurements, simply program the distances used for the measurement and the instrument automatically calculates r using the Wenner or Schlumberger methods. 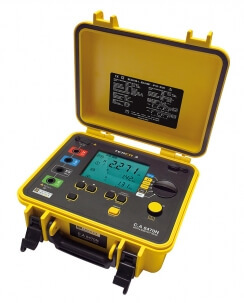 The C.A 6472 can be used for quick, comprehensive surveys of all earthing configurations, offering all the necessary earth measurement functions in a single instrument. 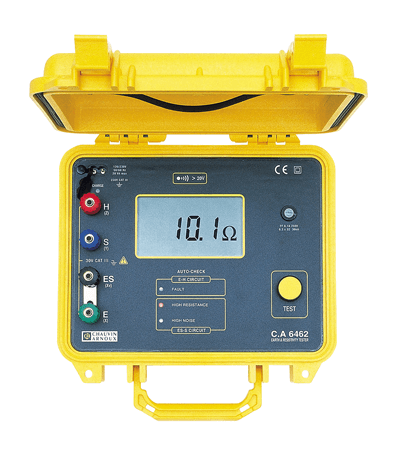 When used with the C.A 6474, it can also perform pylon earth measurements, making it a unique but essential tool for diagnostics and maintenance on pylon networks. 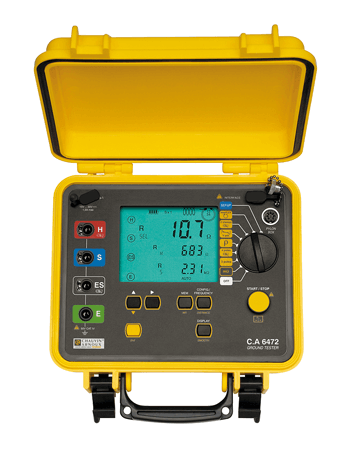 The C.A 6472 offers the possibility of analysing the frequency behaviour of the earth connections thanks to its extensive measurement frequency range (41 to 5,078 Hz). 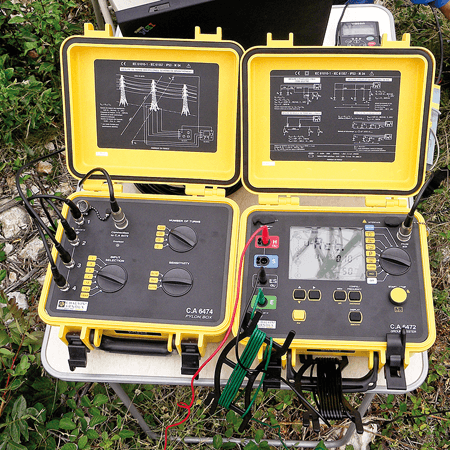 The use of a high-frequency measurement signal makes it possible to assess the behaviour of an earthing circuit in the presence of lightning.